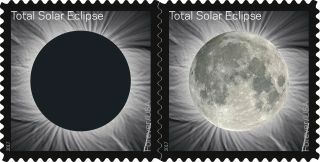 Color-changing ink on this stamp commemorating the 2017 total solar eclipse will fade when heat is applied to reveal a moon over the blotted-out sun. The stamps will be released June 20 in conjunction with the summer solstice. Just as a total solar eclipse will change the skies over the continental United States on Aug. 21, a newly released U.S. stamp will change when pressed with a finger — a photo of the moon materializing over the blotted-out sun. The photographs come courtesy of astrophysicist Fred Espenak, who has seen 20 solar eclipses, including one on every continent. The 2017 total solar eclipse, which some are calling the Great American Eclipse, will be the first to cross coast-to-coast since 1918; parts of 14 states will enjoy views of the total eclipse, and many more will have partial views of the spectacle. The last time a total solar eclipse was visible anywhere over the continental U.S. was 1979. New color-changing stamps that celebrate the upcoming 2017 total solar eclipse feature eclipse and moon photos taken by eclipse-chaser Fred Espenak, pictured above. Espenak shot the eclipse photo in Libya in 2006, and the moon photo comes from his home state of Arizona around six years ago, he said. According to a Postal Service statement, the stamp is being released in conjunction with the summer solstice, and its First-Day-of-Issue ceremony will be held at the University of Wyoming. The stamps are the first ever to feature thermochromatic ink, which will change to reveal the moon photo when rubbed. As it cools off, the moon will become obscured again. The stamps will be Forever stamps, which means they'll always be sufficient to carry a 1-ounce piece of first-class mail. The back of the stamp pad features a map of the eclipse path, detailing eight major cities that will be able to see the total solar eclipse and the times that totality will occur. The back of the 2017 total solar eclipse stamps features a map of the path the moon's shadow will take over the continental U.S. on Aug. 21. Espenak, whose website "Mr. Eclipse" provides a comprehensive resource for viewing and photographing eclipses, advises that people outside the path of totality should still try to make it to a city along that path on Aug. 21 — even if it means staying somewhere miles away and driving to the location in the early morning. "There's no way to oversell how spectacular and incredible seeing a total solar eclipse is," Espenak said. "A lot of people think they've seen an eclipse, [but] even if they've seen a 99 percent partial [eclipse] it pales in comparison to seeing a complete, 100 percent total eclipse of the sun." Viewers must wear eclipse glasses to view a partial solar eclipse safely, but once the sun is completely obscured it's safe to look with the naked eye. And as for the stamps? "I'll be ready to line up and buy hundreds of them," Espenak said. "I expect to buy a lifetime's supply of stamps when this comes out."